When the Recipe Redux challenged its contributors to come up with shower-worthy recipes, I have to admit, I was a little giddy. While I wouldn’t say I am a particularly “girlie” girl, there’s something about a shower. Maybe it’s the irrepressible sense of hope, happiness and expectation in the air. The chance to usher a beloved friend or loved on into the joy and excitement of impending marriage or parenthood. I mean, come on, why on earth would a bunch of women gather in a room where only one of them is receiving presents? Lots of presents. Or maybe it’s just the hope that there will be cake…and that it will be good. Regardless, I am pretty pumped about this month’s challenge. I pondered whether to go the way of a savory dish. One of my go-to brunch dishes is Lemony White Wine Braised Chicken Thighs. Always a hit and pretty easy to prepare. Not very shower-worthy, I decided. Then it hit me. We are quickly approaching wedding season, which, as luck would have it, coincides nicely with warmer weather. Wait….wedding season. Is there a baby season? Hmmm…..never really gave this one much thought. I don’t have kids and, honestly, if there were an actual baby season, I am inclined to be about as excited about that as I am about hockey season (read: not very excited). Not that I don’t love a baby shower. In a moment of “what the hell was I thinking” I once decided that it would be SO cute to make (and decorate) dozens of individual little cakes for a dear friend’s shower (not cupcakes, actual miniature cakes. Let’s just say, she’s lucky I love her). So, wedding shower season-and warmer weather-got me thinking. 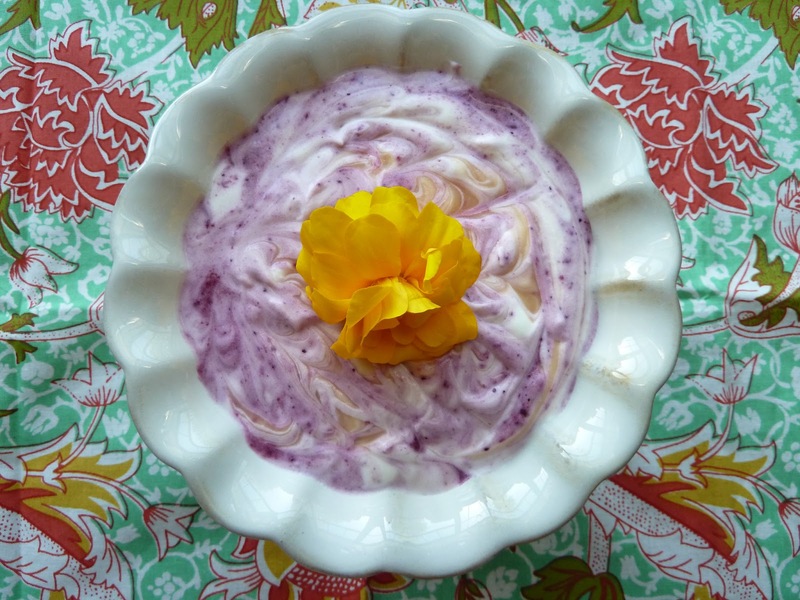 What could I make that would be a pretty (because that does matter here), easy, yummy and healthy way to help a friend celebrate getting married? Then it hit me. A fool! Because, after all, only fools fall in love (or is it rush in?). No matter, you get the point. Now, for those of you who don’t know what a fool is, it’s a super simple dessert made with some sort of fruit compote or sauce and lots of fresh whipped cream. Add a little sugar, some vanilla and lemon and you have a beautiful elegant dessert. Of course if your friend is like a lot of brides, she wants her future husband to be rich. Her shower dessert? Maybe not so much (she has that fab gown to fit into!). Luckily, unlike that fiance of hers, this is one fool that’s pretty easy to change (while still retaining all of the reasons you loved it to begin with). First, substitute much of the whipped cream with non-fat yogurt. Second, replace much of the sugar with Truvia or Splenda (whichever you like or have on-hand). Pretty simple, much lighter and SO yummy! A few notes to keep in mind. First, plan to make the fruit compote and the yogurt the day before (or, at least 4 hours prior to when you plan to put everything together). It’s important to remember that these are the only steps you can do a day ahead….the finished dessert must be made the day you plan to serve it. 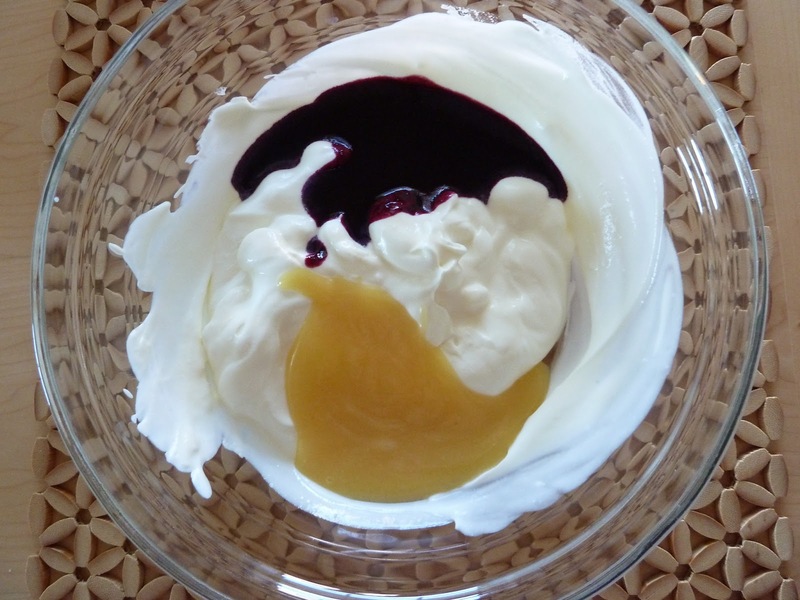 Second, whip the cream to pretty stiff peaks…you’re going to fold it into the yogurt, so it needs to have some body. Third, use regular, plain non-fat yogurt (not Greek…way too thick and tangy). Plan to assemble the fool no more than a couple of hours before serving it (and keep it in the fridge until it’s time to get it out on the buffet). Lastly (and this is important), don’t overdo it on incorporating the fruit into the cream/yogurt mixture. For those of you who embrace your inner OCD-plagued perfectionist, this will be the hardest part. Resist! Look at it like the last potential partner you scared away, don’t be so eager. Be a combination of aloof and someone who isn’t afraid to stir things up–but a little. If you’re serving this at a baby shower, why not take the baby’s gender into account? The blueberries here are lovely for a boy, but don’t be afraid to switch them up for raspberries, strawberries or cherries for a girl (the lemon curd would still be lovely with all). Boy and girl twins?! 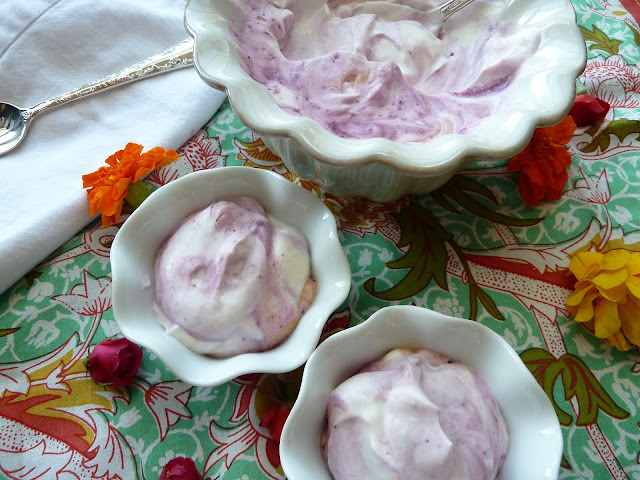 Stick with blueberries and swirl in raspberry curd instead of lemon! This is so beautiful – cannot wait for blueberry season to make it (love blueberry & lemon together.) And Falling In Love With You was my wedding song so clearly I need to make this “fool”! I absolutely love fool and this version looks amazing!